Cults and Daggers is a unique take on the turn based strategy genre. Your goal is to prevent the Old Gods from destroying the world and, at the same time, acquire more hope than than your competition. The game last for seven ages, and each lasts a great deal of turns. A victor is announced at the end of each age, and whoever gets the most ages wins the game. It sounds simple, but the game is rather complex. It can even be a little overwhelming at first. You start by naming your cult, pick a representative icon, choose a power, and select one of three randomized disciples to start with. Powers offer bonuses for particular skills like hiding, searching, persuading nobles, and gaining faith if murdered. These little things really influences how the game is played and lends itself to replayability. The three disciples you can choose from have their abilities presented on screen and offer a hint of their stats. Someone with Master of Disguise will be good at hiding. Eagle Eyed will be good at searching. Stone Cold Killer will be good at defending and killing the agents of other cults. When the game starts, your disciples are scattered across the world. Represented by little squares, clicking them will display their picture profile and an important collection of stats: Teaching, Hiding, Searching, Killing, Occult, Persuasion, and Preaching govern whether or not an action can succeed. A high teaching skill will make it easier to get new recruits. Occult is how you gain occult points, which along with faith, lets you use special miracle actions to help you or hinder your rivals. 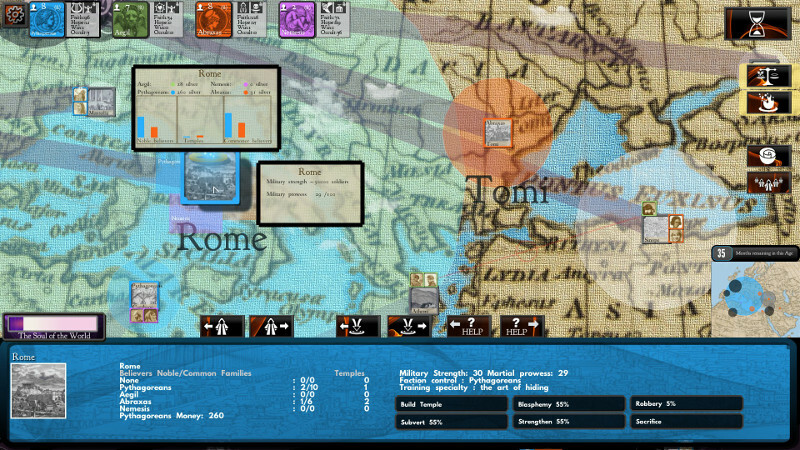 Persuasion lets you coax nobles of the city to join your faith, which in turns lets you take control of the city. Preaching is how you spread your word to the common folk masses. One thing I really liked was that using these skills gives them a chance to increase, regardless if they succeed or fail. If you begin the game with a few disciples lacking in any given skill, spend a few turns to increase their competence. Skills are ranked from 1 to 100, 1 being poor and 100 considered super human. The basic idea is to convert cities to your faith and gain hope. The cult with the most faith of the month gains hope. However, random events can take you from first to last place in a single month if something bad happens in a city holding them. Also, years pass between ages and randomize everything again. This makes the game a little more challenging in a way. Even if you were miles ahead in the first age you may need to work to recover in the next. Likewise you could lose by a landslide in one age, then in the next start off with an advantage and capitalize on it. Converting cites seems like a simple task, but know that other cults are trying to do the same. They WILL come after your disciples and kill them. Teaching will get you new recruits in the likely event that some get taken out, and Hiding can come in handy too. The higher the Hidden level, the more embedded into society they are. Some actions, such as persuading, will not break hiding. Others such as preaching openly to the masses will. Another concept unique I found is how the money system works. Unlike most strategy games where you have currency to spend anywhere, here money is spent in the city it is earned. So if you have 100 silver in Rome, that will do nothing for you in Babylon. Occupied cities have additional gameplay options. Build temples or increase there level, weaken cities to sabotage a rival's control, and blaspheme under the name of another cult to lower there standing. If you are unsuccessful in pinning it on someone else, your disciples will be hunted down by the local guards. You can try to rob the temples of other cults, as well as use the sacrifice option to have a festival and bring hope. Faith and Occult (which you can gain through the Delve into the Occult option) are another currency of sorts. Not only does having the most faith grant more hope each turn, you can also spend it on miracles to help you and curses to hinder your foes. All the while you have to be mindful of places of power around the world. These will have challenges to be met in order to prevent them from unleashing evil onto nearby cities, lowering the hope of the world. It will tell you what skill is needed to be met in order to defeat it, what reward you will get if you succeed, and what will happen if you don't. The map background looks pretty great but a lot of the fonts are just too tiny. Info will pop up and if you are sitting any reasonable distance away from your monitor you may have difficulty discerning what its telling you, and I feel the interface could be made a little more user friendly, and some things in general could use some more in game explanation. But other than those minor grievances, I found the overall experience to be a fun, unique experience that lends itself to a variety of play styles, giving it a good amount of replay value. With a little more polish, it could become a cult classic. Invisible Inc. is a game with a lot of hidden depth that is waiting to be explored and exploited.